Changing The Module: Ensemble to Chekhov Technique. In two weeks time, I will be saying goodbye to my autumn module in Ensemble/Devising on the Masters in Drama and Theatre at NUI Galway that I have been teaching since the course began in 2000. Next year I will be teaching a Chekhov Technique class instead, working with the technique and with text and I am very excited about that. In some ways the work will be similar, especially as so much of what we work with in Ensemble/Devising is to sensitise the body to sensations, qualities of movement and emotions which is very much part of the Chekhov Technique too. But it is still with a degree of sadness that I say goodbye to Ensemble and Devising. It has been a wonderful journey, and many extraordinary people who have since become actors, writers, directors, teachers and academics have experienced the module and hopefully learned something about the essence of what theatre is and might be. I know I have learned a lot myself. 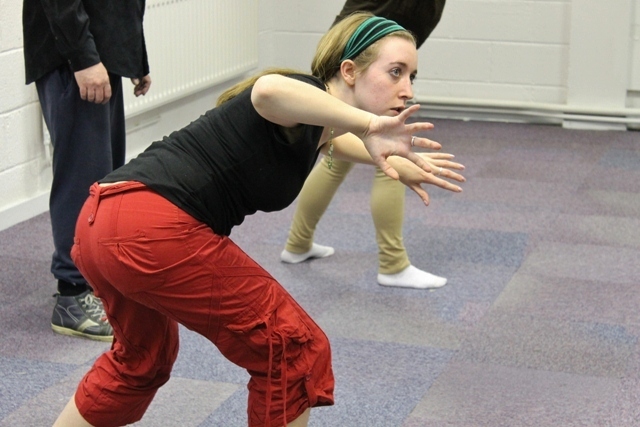 As someone said the very first year the module was running, “Isn’t this amazing to get an MA while exploring how to play and doing yoga?” That is the basic tenet of all theatre learning as far as I am concerned, to learn how to play. The ideas we explored that first year were bold and anarchic, the group brave and extraordinary. Whilst I struggled with the rubrics of working within a university context, we produced a defiant piece about Christmas, and within the site specific exercise one group performed a disturbing scenario within one of the squash courts, whilst another created a massive snakes and ladders board projected onto a steep bank of desks. Over the years the site specific work, whilst sometimes problematic from a practical point of view has been extremely rich .One of the highlights for me was a group piece performed in a ladies toilet. The place became a chamber of transformation as actors were ‘born’ from cubicles and discovered themselves in the mirror, and then found the wonder of running water. Another was a hilarious ‘chimps tea party’ in an enclosed garden of semi tropical plants in the science department. I remember someone I had always considered rather self absorbed, saying in a group discussion one year that she found when she started in the group that she would only gravitate towards working with the people she felt were at her level, until she discovered that to make good work, if you had someone within a group, you had to embrace them . Everyone mattered. This is one of the most profound and revolutionary acts of learning that working in ensemble can give us, and as far as I am concerned one of the most value in working with theatre. It is at least as important as anything you learn from a book. The one time in fourteen years when serious personality disruption occurred ( many years ago) it crippled the group from producing very much valuable work. It was a truly difficult experience for everyone. It made me realise how dependant we are on each other to produce anything valid and worthwhile, not only in theatre but often in life. Another wonderful experience was when Martin Sheen, who actually studied at NUI Galway for several months, appeared one morning to talk to us, not about The West Wing or Apocalypse Now, but about his time with Julian Beck and Judith Malina of the Living Theatre when he was a young actor in New York. The module has always been 75% practical. I have always believed the practise has to come at least with the reading, and preferably before, in order to learn something truly of value. That way the person gets a learning inside of what ensemble is, deep in their very being. The work has a degree of the spiritual and ‘making the intangible, tangible,’ as Michael Chekhov said. That has always been been what has attracted me to ensemble , especially to the likes of Brook, Lecoq, Grotowski and of course Chekhov, because they were trying to somehow explore the invisible. This does not have a lot of place in the ‘business’ which is probably why I have never liked it. Through the course I discovered that many acting techniques and theories have the same basis and ethos, and that whilst a group can be bound by a technique whichs give them a vocabulary, a fixed process can also limit the group. I discovered that there was such a thing as ensemble ethos and ensemble style and the two things were intrinsically separate . Ensemble style was something we were far more likely to see in the commercial theatre, where the ensemble buzzword is so often used. For several years I have incorporated more and more Chekhov Technique in the exercises of our time-limited sessions, to encourage more creativity, which has certainly paid off and equipped the student imaginatively. The first performance exercise in the module for many years has been to recreate a fairy tale through ensemble and little dialogue. This incorporation of Chekhov exercises has been fruitful and interesting because although so much Chekhov work is used for scripted work, he himself used a lot of myth and fairy tale work in the early training. In the early years of the module much more time was spent in rigorous exercises of discipline and team building, and whilst there have still been plenty of those this year I have preferred to encourage the team building as much with imagination and radiating and receiving as I have from technical prowess. Technical skill alone can result in a thinner performance, if it is not supported by the cradle of the imagination. So, may the final site specifics begin , and may the new intake prepare to be immersed in the Chekhov Technique and deep work on a play written by his famous Uncle! I can’t wait!. This entry was posted in Uncategorized and tagged Chekhov Technique, Ensemble, Martin Sheen, Theatre Education on November 17, 2014 by maxhafler.